zenpundit.com » Blog Archive » Okay, Renaissance photography? First, let’s get Karl Popper out of the way: I don’t think that’s a fa;sifiable statement. But does it ring true for me? Caravaggion himself fled Rome to escape a death penalty for murder, perhaps that’s a pre-requisite for his tenebrist style of painting, perhaps not, who knows? And the photographer? Dare I ask? Apparently the photo credit goes to Marcus Yam/LA Times via Getty Images. The photo again, since it may have risen out of screen, out of mind. The photographer certainly (my view) has an eye for framing, but that’s largely what photography is all about, isn’t it? That slashing diagonal — powerful. Who’s the guy standing, left, a bit detached? Not a Buddhist, I think, in that balaclava. Is that individual. isolated, or the entirety of the clash, what Burge sees as painterly — forget the Renaissance for a while here — ? 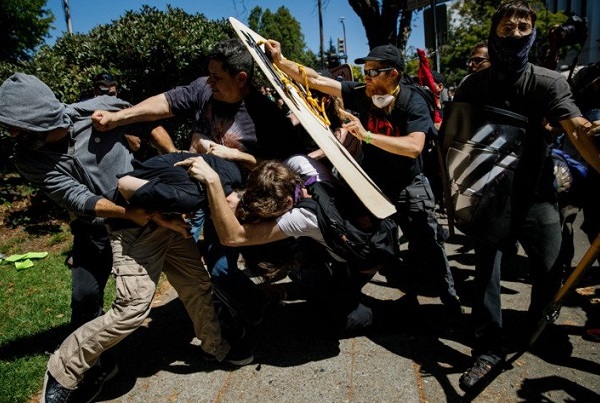 Black-clad anarchists attack conservatives at Berkeley rally runs the headline in the South Chibna Morning Post, and they’d know, right? South China, Northern Cal.. The brush strokes — there are no brushstrokes in photography. Unless you use an app to put them there. Is there a brish stro0kes equivalent? Chiaroscuro — light-dark contrast — arguably, the sun’s too bright for much of that in Berkeley, and the anarchists’ black will have to make up for it. 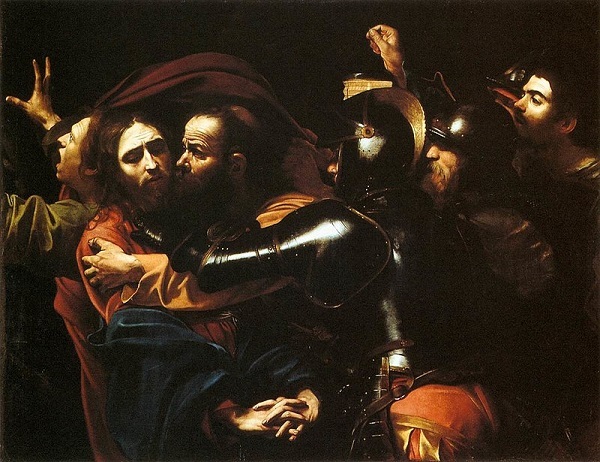 Not so when Christ is arrested — that’s simply dark, and Caravaggion illuminates the players. How much light-dark contrast does the headline’s reference to “black-clad anarchists” add to the viewer’s perception of the image? Is it the word “black” or the word “anarchist” that does it? Following the news is a complex affair. But a lover affair in any case, if that’s your preference, as it is mine — it gets me from Berkeley and stupidity to Caravaggio and Chirst, okay? This entry was posted on Wednesday, August 30th, 2017 at 8:00 pm	and is filed under art, art history, beauty, biography, Charles Cameron, christianity, criminals, philosophy, photography, Uncategorized. You can follow any responses to this entry through the RSS 2.0 feed. Both comments and pings are currently closed.